Institute's Michael McCrudden fired home his fifth goal of the season. Institute’s nine men somehow secured a point thanks to Michael McCrudden’s late penalty to deny table toppers Dergview. Kevin Deery’s side showed great spirit to somehow battle back to earn a 1-1, after Sean McCarron and Darryl McDermott were both red carded in the second half. 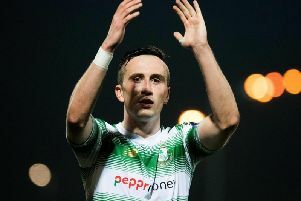 Former Stute man Ivan Sproule gave Dergview the lead after the break, before the red cards, but a controversial late penalty decision by referee Neil Robinson meant Stute won a point. The Waterside men went close on five minutes as Ciaron Harkin’s inch perfect pass found Ryan Doherty, but the midfielder’s close range strike was straight at Dergview keeper Kealan Mulcahy. Mulcahy was called into action again soon after this time getting down low to keep out McCarron’s strike. Just after the half-hour mark Ryan Morrow’s right wing cross found Doherty, but the Stute midfielder failed to test Mulcahy and headed over from six yards. On 40 minutes, ex-Stute striker Ryan Campbell went close to scoring but his low drive from the edge of the box was kept out by keeper Marty Gallagher. Dergview should have taken the lead on 54 minutes when Sproule got in behind the Stute defence, but his goalbound low drive from just inside the box, was superbly blocked Gareth McFadden. The visitors did break the deadlock on 57 minutes as Campbell released Sproule and this time he made no mistake, side footing home past Gallagher. Institute’s poor start to the second half continued as they were rightfully reduced to ten men on 66 minutes as McCarron was shown a straight red card for a challenge on Gareth Porter. The Drumahoe men had a second man sent-off on 80 minutes as McDermott was cautioned for a second time, after he pulled down Sproule on the half-way line. Institute were given a very fortunate penalty on 87 minutes as referee Robinson pointed to the spot after Jude Ballard was adjudged to have handled the ball inside the box. After McCrudden fought to get the ball from Harkin, he placed the ball on the spot, before firing home the resutling penalty, low into Mulcahy’s bottom right hand corner. In closing stages Sproule should have won it for the visitors but he was denied by an out-rushing Gallagher and the nine men, who continued to push forward looking for the win, settled for a point. Institute: Gallagher, O’Donnell, McDermott, Scoltock, Morrow (Jarvis 76); Cooley (McIntyre 65), C Harkin, Doherty (Pomeroy 65), McFadden; McCarron, McCrudden. Dergview: Mulcahy, Porter, Robinson, Falconer, Buchanan, Sproule, Arkinson (McBride 74), McManus, Ballard, Campbell, Curran (Cashel 78).